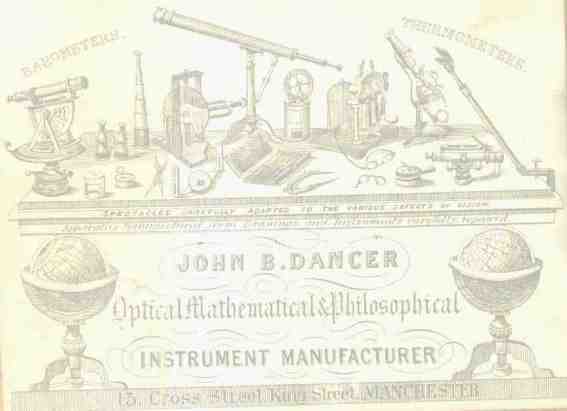 My interest in Dancer instruments stems from my early life in the design and development of scientific instruments. Whereas Dancer was working at the peak of optical instrument development in the second half of the 19th century, I was privileged to be treading a similar path a hundred years later in the age of the silicon chip development. Although I cannot claim any inventions or discoveries, my work as an electronics design engineer exposed me to the delights of seeing my new designs in production as well as the heartache when, despite long hours of unpaid experimentation, an idea failed to match up to expectations. I should also point out that Dancer's many elegant solutions to the various problems encountered over the years, reinforce one of my very first lessons in design. "The best solutions are always the simplest". That certainly seems to have been the case with Dancers instruments (How far apart should the lenses on a stereoscopic camera be? The same distance as a normal pair of eyes of course.). This together with a very close geographical link (I was born only a few hundred yards from Cross St. in Manchester, where he worked some 100 years before I was born) has prompted me to record my observations on the Dancer instruments. MICROSCOPES, slides and accessories and of course microphotographs. This web page is copyright ASIUK. The information may be freely used and distributed for personal interest but not for commercial gain.